This is, simply, the “original similarity” discovered by Patriarch Nasrallah Sfeir when asked what’s common between him and Hezbollah Secretary General Sayyed Hasan Nasrallah. Sfeir, who was speaking to pan-Arab daily As-Sharq al-Awsat, summarized the “common things” between him and the Resistance leader to the “name” of Nasrallah, which is his first name and Hezbollah Secretary General’s last name. 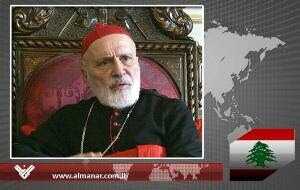 “We are both Lebanese, and this is enough,” the Maronite Patriarch went on to say. “He’s of course a leader and a politician. He has his own points of view,” he added. Sfeir, meanwhile, accused “some” of wanting to bring down President Michel Sleiman and warned that abolishing sectarianism means that one group will take control of the country. “There are those who want to overthrow the President to take his place,” Sfeir said in an interview published Tuesday by pan-Arab daily Asharq al-Awsat. Commenting on the so-called political campaign against Sleiman, Sfeir noted that the campaign did not come from nowhere because there are people who are planning it. “There are some who have political and personal interests and others who want to topple the President to take his place, and perhaps there are some who have other plots,” he added. Sfeir hailed President Sleiman, saying he is seeking to unify Lebanese as much as possible. “Unification, however, cannot be done with a magic wand,” he believed, adding that Lebanese will have to meet Sleiman’s urge to unite. “It seems, however, that so far there are those who do not want to respond to his call,” Sfeir said.